← We are looking for an intern! Poet Shikha Malaviya, considers herself a morpher. She was born in the U.K. but grew up in the US and India. Raised in a family where books, good food, music, art and candid conversations always took center stage, it is no surprise that she took to poetry at a very young age. Her grandfather was also a poet. Shikha loved school and is a life-long student. With English as her favourite subject, she started penning poems since she was nine years old. Here she talks to Chaithali Pisupati from Team BWW about her journey, inspirations, and challenges. There is something powerful yet compact about poetry that appeals to me the most out of all literary genres. I find poetry akin to meditation. Poets are ruminators that are constantly taking the pulse of the world through words. I try not to be bogged by one form of poetry. I let the theme and mood of the poem dictate the structure. One has to surrender to the muse/feeling/experience. Tell us about Geography of Tongues? Geography of Tongues is an exploration of family, cultures and the idea of home/identity. My hope is that the poems in it have touched on the universal, through a narration of the personal. They are a fusion of East and West, from the years I’ve lived in England, India, and the United States. I like to experiment with style and so it contains prose poems as well as lyric ones. I am very excited to see how it will be received. You mention that Geography of Tongues is a collection of a range of poetic forms, what made you incorporate different forms in one collection? My poems are a combination of the lyric form and prose poetry. I feel using a combination of both forms helps emulate the changing tenors and topographies of the subjects/themes in my poems. I also like using internal rhymes and alliteration, along with powerful imagery. What is the poetry scene in India? I think the poetry scene is vibrant yet scattered. So much is happening in different corners of India. The North-east part of India has some fantastic poets. But we don’t hear of them as much. We need more venues for poets to meet and share their work. I can’t comment on regional languages as I don’t know enough, although there is quite a bit of activity here in Kannada poetry. Mamta Sagar comes to mind. Tell us about your process. How do you start a poem, and how long does it take you to finish? It is a very organic process and often, the decision isn’t up to me. The subjects, events, and emotions often show up like a friend at my doorstep that I have to let in, not knowing or able to ask how long they’ll stay. My poems are mostly autobiographical and inspired by family, history and mythology. All of these are intertwined in one’s day-to-day living. Typically, each poem goes through a few drafts—mostly tweaking in the form of changing a word, fixing a line break or clarifying an image. I ruminate over most poems/themes in my mind for a few weeks before I commit them to paper. Revision is every writer’s not-so-secret weapon that turns a piece of coal into a diamond. I have a few poems that I have held on to for ten years, because one word doesn’t sound right or the rhythm is off. It’s a very intuitive process. If and when a poem flows out without needing any changes, it feels like a gift from the divine. Why did you choose to publish your first collection through The (Great) Indian Poetry Collective? Why did the Collective come about? The idea of a collective really appeals to me for so many reasons. I’ve always loved collaboration in the creative process, and to work with other poets who share a powerful vision for advancing Indian poetry has been a dream of mine. I’m also fascinated with the process of publishing and design. By publishing collectively, we don’t have to deal with the bureaucracy of a traditional publisher; the poets have control over how their own work appears. The fact that I can be part of the entire process, beyond just the writing aspect, feels very empowering. I’m excited to empower other poets and to discover and publish new voices. There are very few serious outlets for publishing high-quality books of poetry in India, and the Collective was created to bridge this gap. What can we look forward to from The Great Indian Poetry Collective in 2014? We are so excited to be publishing 2-3 more books in 2014. Minal Hajratwala’s book of poems, Bountiful Instructions for Enlightenment, is slated for release in March 2014 followed by Ellen Kombiyil’s Histories of the Future Perfect. We will also be doing anthologies with multiple poets. Stay tuned for some fabulous Indian poetry in English. Publishing poetry is a challenge. Would you agree? Poetry indeed has its challenges, despite being a very old art form. Publishers feel it isn’t marketable and the audience is a more selective one. Poetry also has a reputation for being too cerebral and/or esoteric. If a poetry book is published, the returns are barely enough to reinvest. So, whoever is a poet, is definitely in it because they love the genre. Also, in India, there are no formal writing programs and that leads to an uneven standard of poetry. But things are definitely improving. BWW is definitely on to something, by providing a platform for writers to learn about writing and hone their skills. What would you say to someone aspiring to publish their work? Make sure your manuscript is as complete as possible. Do not send half a manuscript or a proposal. Poetry requires the whole book. Do your research before approaching publishers. Have people read your manuscript. Find a mentor/guide to help you. Take feedback seriously, without feeling wounded or defensive. Presentation is key, along with tight editing. I’ve received very sloppy submissions where the point size and font of each poem is different. Be consistent. And last but not least, read, read, read, write, write, write. I cannot emphasize that enough! Any mistakes in hindsight with regard to publishing your book? There are no mistakes. Everything is a learning experience. We were so into the process of editing, design, and printing that we didn’t realize that setting up online distribution would take time. Also, we were having trouble getting the right paper for the cover. What we learnt is that all processes take time and that we must accept and work with that. No fear! I would advise any upcoming poet/writer to read as much as possible, to write and experiment with as many different forms and to not be afraid to take risks. Anthologies are a great way to explore many voices in one place. I also believe it is very important to understand one’s literary/poetic history and legacy. Who were our literary forebears? Why did they write the way they did? What can we learn from them? I also believe that revision is the most powerful tool a writer can have. Revise your manuscript once, twice, fifty times! Poetry, particularly, is like sculpture, which you have to chip away at until you see its true form come through. Most great poems/stories have been written many times over. But all the audience sees is the final product. I think it is very important for all to understand that writing is hard work and that it isn’t simply about stringing together a bunch of words. Also, I would like to add to the infamous writer’s advice phrase: Write what you know. Write what you know, write what you don’t know and would like to know, or write what you think no one knows. It’s all about creating worlds, real and imagined, that touch us somehow. 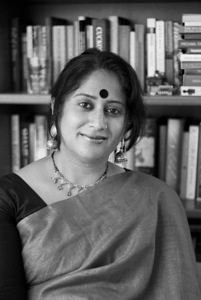 This entry was posted in Guest Post, Writing Craft and tagged Bangalore Writers Workshop, Geography of Tongues, Poetry, Publishing, Shikha Malaviya, Writing Craft. Bookmark the permalink.